BY KEVIN SAWYER – Surgeons in India had to surgically remove 40 knives from a man’s stomach after he seemingly went on a knife eating binge for two moths. No one, especially the knife eater, can make an educated guess as to why he suddenly developed an intense craving to eat the metal knives. 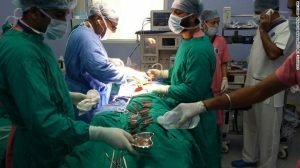 The operation happened at Corporate Hospital in the Indian city of Amritstar and it took five hours after having been planned for two days. All the knives taken from the man’s stomach were of the foldable type and were seven inches in length when unfolded. The surgical team said that some of the knives had been swallowed in their open position and more than a few of them had begun to rust. The surgical team said that the operation was a complete success and the patient will rest and see a psychiatrist and will, hopefully, be released from the hospital in a couple of days. The patient said he had simply become addicted to the knives and the taste of metal. He thought it no different from becoming addicted to drugs. Dr. Malhotra thinks the man has a certifiable psychological disorder that is so rare that it hasn’t a name or even been studied by the psychology world. The doctors visited and joked a bit with the patient as he rested in recovery. The doctors told him that if he really needed iron so badly that the next time he has an intense craving he should just try eating some spinach.